Ticker Sense’s blogger sentiment poll is one of the lesser known sentiment measures so you’re forgiven if you aren’t familiar with it. The most recent survey results, from October 13th, show that there are no bears. Zero. None. Zilch. Three quarters are bullish while the rest are neutral or can’t make up their minds. According to contrarian analysis, this might be a negative sign. Or maybe it is a bullish sign. After all, shouldn’t these people be “experts”? If they parse the market on a daily basis, invest and trade regularly, shouldn’t they have a better idea than the average person out there? So does the runaway bullishness in this week’s sentiment survey mean that we should sell? or buy? The conclusion I draw is that the poll is simply meaningless. It provides no significant piece of sentiment information we can use. At times it is bullish and at most other times bearish. But there is no connection whatsoever with the market. This latest data point is the highest bullishness but I don’t think it really makes any difference. According to its past, the survey can not be used as either a contrarian measure nor as a straight indicator of any kind. Honestly, I’m really surprised that the folks at Ticker Sense are continuing this survey. I feel your historical analysis of the Ticker Sense indicator should be revisited. You concluded there is no edge in the data. However, when I look at when there are more bears than bulls, July 2006 to around July 2007, that’s when the general market went up (a lot). 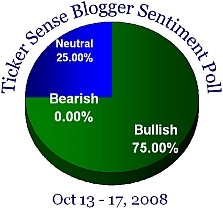 Then around August 2007, that’s when the bloggers generally got consistently bullish. That was the beginning of the cyclical (and perhaps secular) top. They stayed net bullish through January 2008, at which time they flip flopped bearish and bullish in the first quarter of 2008. From April to June, they were bearish, while the general stock market had a bear market rally. During August and September 2008, before the rapid fall in prices, they were generally net bearish, but right before the panic drop, they turned bullish and have become more net bullish ever since. Clearly, the majority are wrong, especially when it comes to the major trends. I suspect you are only looking at peaks and troughs in the data rather than the net difference in bullish or bearish sentiment. The reason I think this is the case is that bloggers never have any real money on the line. For them, missing the bottom or top means losing the chance at bragging rights. That is why bloggers are a good contrary indicator for major trends. They will call a top all the way up a bull market, and call a bottom all the way down the bear market. It is more important for bloggers in general to get a top or bottom called correctly to brag about it than to ride a good trend with real money, which is very hard work. Some do trade real money, but they aren’t posting the real positions or if they are any better than buy-and-hold investors. They are just posting an opinion. And you never get credit for riding a good trend; but you do make personal headlines by declaring a correct top or bottom. But the good or bad news is that bloggers seem to change their opinions rather rapidly at times. The question is when the market will crush the bullish spirit out of them. That probably could happen with one more very swift but brief selling period. It will be interesting to see if Oct. 27th posting will reflect the retesting of the lows and the rapid changing of sentiment. worldtrader, you could be right, there are more data points now to analyse than when I did back then. However, I don’t think bloggers go for adulation any more than tv pundits or maniacs like Cramer. I’ve had some unbelievably prescient calls (as well as my share of horrid ones) and no one has hoisted me above their shoulders in celebration… although a few have tried to tar and feather me when I pan their positions.